Update 10 April 2016: And Moultrie, GA April 15th. Suwannee County told Sabal Trail to move the Hildreth Compressor Station. Suwannee County this week followed Hamilton County in asking the U.S. Army Corps of Engineers to come see what Sabal Trail didn’t tell FERC about sinkholes, springs, underground caverns, plus numerous related pipelines, LNG export operations, and bomb trains schemes. The Georgia House on March 22 voted by a historic 34 ayes to 128 nays to deny river-drilling easements for Sabal Trail, led among others by Rep. Winfred Dukes of Albany, where Sabal Trail wants to drill under the Flint River and build a compressor station in an environmental justice community. 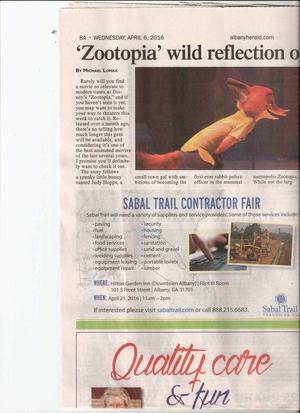 Look in the dictionary under chutzpah (insolence), and you’ll see Sabal Trail’s picture. Two years ago in Gilchrist County, FL, Sabal Trail admitted it had already hired pipeline installers. Now it throws the locals a bone of temporary jobs for compressor stations. Does that seem enough to you for eminent domain for private property and permanent destruction and hazard? Especially when wind and solar power are winning twice the investment and deploying far faster than coal, oil, or natural gas? When: 11AM – 2PM, Thursday, April 18th 2016? Where: They’ll probably hold the meeting in Kissimmee, possibly at the Civic Center where FERC held its Scoping Meeting. Seen: Gainesville Sun, April 6th. Seen: Suwannee Democrat, April 8th. Same place as FERC’s 2014 Scoping Meeting. Seen: Albany Herald, April 6th (pictured). When: 11AM – 2PM, Friday, April 22nd 2016? Where: FERC’s 2014 Scoping Meeting was at Central Alabama Community College, although more likely Sabal Trail will pick a private venue. Anybody want to welcome Sabal Trail back?